Tariq Aziz, the Iraqi foreign minister under Saddam Hussein, is in hospital after suffering a stroke in jail in Baghdad, his son and lawyer say. Aziz's son, Ziad, said he had been told his father, 73, had collapsed in his cell and "completely lost his speech". Aziz has suffered from ill-health since his surrender to US troops in 2003 and his family have urged his release on humanitarian grounds. He was jailed for 15 years in 2009 for the executions of 42 Iraqi merchants. 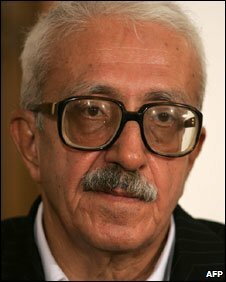 Aziz, a Christian, was Iraq's foreign minister during the invasion of Kuwait in 1990, later becoming the deputy prime minister.